The Marvel Universe has changed shape yet again, and this publisher would certainly be remiss to skip an opportunity for a whole fleet of one shots and mini-series geared to elaborating upon those transformations. In this case, the publisher's taking advantage of a rare bit of down time for one of their premiere families, the X-Men. With Second Coming now in the rear view mirror, the timing is right for the mutants to take a breath and look around at what their peers have sown. While the team was off in San Francisco doing what they do best, the rest of the world didn't quit changing. Maybe, just maybe, that means their spot in it is also ready to shift a little bit. 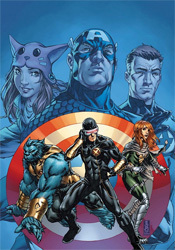 This extra-sized issue takes the interesting approach of assigning each of its three primary artists to a different focal character, with Whilce Portacio handling Cyclops in the Savage Land, Steve Sanders following the Beast on sabbatical and Jamie McKelvie covering Hope's visit to the Baxter Building. The three employ very different styles, which makes the transitions from one setting to the next seem more like a new chapter and less like a subtle conversion. Portacio works a slightly cut back version of his action-friendly, ink-heavy technique from the early '90s, a good fit for Scott's moody, brooding adventures in the jungle. He's loosened up a bit since his first run with the X-Men two decades ago, noticeably cutting back on the linework and streamlining his approach, although I'm not quite sure which version I prefer. Steve Sanders couldn't provide much more of a contrast, balancing the issue with an extremely simple, cartoonish approach that's more along the lines of America's Best Comics veterans Zander Cannon and Chris Sprouse. His rendition of the Beast, and his ensuing interactions with Runaways graduate Molly Hayes, may as well have been pulled directly from a fairy tale. Take that for what you will, but there's no question it's an appropriate choice for the playful mentality of the two central characters. Finally, Jamie McKelvie rounds out the artistic trifecta with an effort that seems to be an awkward marriage of Portacio and Sanders's preceding works. McKelvie's clean lines and vast expanses of negative space give his chapters a simple, straightforward flavor but the lack of exaggeration and more grounded perspective also lends his work a more serious tone. Of the three, his style is the least interesting, although he's also dealing with a pretty dry subject matter, at least visually – Hope passing time during an array of tests, evaluations and body scans by getting to know Franklin Richards. While the concept of a three-headed narration may lend itself to visions of disjointed narrative leaps and a jerky, confusing pace, Matt Fraction actually manages to handle it with some grace. Remember those old sketch comedy formulas, when one skit would lead into the next with a shared word, action or object, somehow bridging the gap between two totally unrelated stories? It was a staple of Monty Python's Flying Circus and, years later, The State. Fraction spins something similar here, expertly shifting locations, moods and characters without bucking his readers in between pages. It probably helps that each chapter is somewhat laid back, focused more on a calm, casual series of chats on a variety of subjects than an invading alien fleet or the next great Terran threat. Fraction manages this kind of story skillfully, not that he always gets a chance to show it in the fast-paced land of the X-Men, so it's nice to see a different side of both the writer and the characters for a change. X-Men: The Heroic Age isn't required reading, but that doesn't mean it's without merit. In fact, given the hectic pace of the regular books and the sheer number of faces bouncing around the fringes of the team, this might be your only chance to enjoy some quality character moments without the backdrop of a big ongoing storyline looming over every word. Matt Fraction brings the goods, and though each artistic showing is spotty at times, the whole book comes together nicely when all is said and done. Borrow it, even if you're not a present fan of the X-Men. It's good, intelligent reading.